According to the 1897 All Russia census taken in the Rezekne area his name was listed as Gurevitch Genoch Girshev. The Girshev is the patronymic for son of Hirsch. Our researcher, Aleksandrs Feigmanis, notes that this is an error. The Rezekne vital records entry at July 5, 1882, recording the birth of their son, Yeruchim (Reuben), shows his name correctly as Genoch-Girch Gurvitch, son of Getzel-Leizer Gurvitch. His wife was shown as Baseva, daughter of Morduch. His first name was Henoch, Genoch, Henech, Genech they are all variations of the Bible prophet Enoch (English). His second name was Hirsch, Hirsh, Girsh which are all versions of the same word meaning stag deer. On April 17, 1979, just a month or two before she passed away, I had the pleasure of meeting with Aunt Bessie, Henoch's youngest child. She could hardly remember her father or her mother. Aunt Bessie said that she came to America in 1910 when she was age 11 one year after her father had died at age 71. She thought she had been born in 1888 but according to her daughter Sylvia, she was born in 1896. Assuming she came to the US in 1910 she would have been about 14. Accordingly, if Henoch died in 1909 at age 71 his year of birth would have been about 1838. In the 1874 Russian census Henoch is shown as age 37 indicating a birth year of about 1837. In the 1897 All Russian Census Henoch was listed as age 55. This would indicate a birth year of 1842. For the purposes of this history we will use 1838. In the Rezekne Family List he is shown as 59 in 1896 which would make the year of birth 1838 which agrees with Aunt Bessie information. According to Aunt Bessie, her father was in the timber business, where they cut the trees and floated them down the river. She said he was in business with his father and his brothers and that they were well off. She said her father's family was originally from Moscow. I had assumed this was Moscow, Russia. 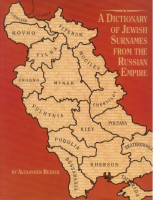 However, I have discovered that there is a district in Riga along the edge of the river named Moscow and it was an area occupied by Jewish people. They would gather up the timber that had been floated down the river. Riga is not on the Baltic Sea but on the banks of the River Daugava and was a major export center for timber. Ships came from Briton so freqently there was a large Church of England cathedral in Riga for the crews. Ships also came from France to pick up wood. The Daugava was a very important river that served as a gateway to Central Europe from the Baltic Sea. The Swedes at one time had a major presence in Easter Europe and controlled the Baltics. They viewed access to the Daugava as strategic. Today the Daugava defines a portion of the border between the countries of Latvia and Lithuania. The second largest city in Latvia is Daugavpils which is a key inland port on this river. When this area was part of Russia the city was named Dvinsk and had a very substantial Jewish population. Daugavpils is about half way between the very important city of Vilnius, Lithuania about 100 miles to the south. Vilnius was known as Vilna during the era of Polish and Russian dominance and was the capital of the Jewish sub-Polish state in the Lithuanian region. The city was governed by Jews. Today Vilnius is the capital of Lithuania but has only a tiny Jewish population as a result of the very effective extermination of Jewish people in the Baltic region during World War II. 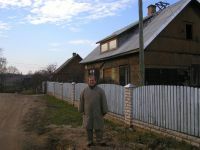 About 100 miles to the north of Daugavpils lies the city of Rezekne, the capital of the Latgale Region, also a city with a large Jewish population. Our family comes from Rezekne but they clearly had Horwitz relatives in Daugavpils and Riga to carry out their very important timber business. He married again and Bessie did not get along with her new step-mother. Her family was living in Latvia. Bessie did not know the name of the first wife. She had died many years before. Bessie was the daughter of the second wife who she said was Basheva Yaffa. Bessie explained that the family paid for their relocation to America by working and saving. They also sold the family home and cows. They settled up with their step-mother and used what was left to go to Chicago. Bob Schwartz has Bertha Louria as the wife of Henoch Hirsh. This is something we will have to work on. The 1897 census stated that he was literate that he had been educated in the parish school and that the was etiher a flax merchant or timber merchant. Aleksandrs said it was difficult to read the text and there is only a sight difference between the way the two words are spelled. He though flax merchant might be a better translation. However, wood merchant would be consistent with what Aunt Bessie said his business was. They were residing in a single family dwelling at house 10 on Dvoryanskaya Street in Rezekne, Latvia. The house was wooden and covered with wood. He was apparently a hard working, wealthy, soft spoken (never used strong language)man. He was in business with his father and brothers. Their family was known for their financial success in the lumber business. Dave Howard Aug 2004. Henoch Hirsh Gurevich (Horwitz)- back of photo. The studio was in Latvia. 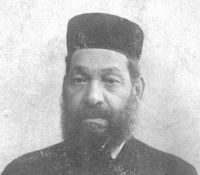 Henoch Hirsh Gurevich (Horwitz). Photo taken in Rezekne- Latvia. The Deer as the symbol for Hirsh, Stands for the Tribe of Naphtali, Hirsh means Deer in German/Yiddish and is Tsvi or Zvi in Hebrew. Riga is a lovely city on the banks of the Daugava River just as it enters the Baltic Sea. 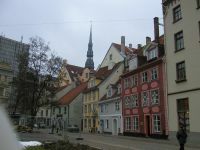 There is an old town which has been beautifully preserved or restored. This area is mostly a walking area. Cars may enter but must have pass cards. There rest of the city is modern and spread out. Since the fall of the Soviet Union almost all signs are in Latvian or English. There are suburban areas with wide roads and stand alone stores. Latvia exports large quantities of timber from its forrested lands. The Daugava River used to carry the logs to the seaport. Now trucks carry the logs to Riga. The Daugava was an important entrance into Central Europe for the Vikings in ancient times. [S3] Rezekne Family, Family 138 (Reliability: 3). Gurewitsch, Genech, son of Getzel, age 59 in 1896 died 18 May 1909 in Rezekne.